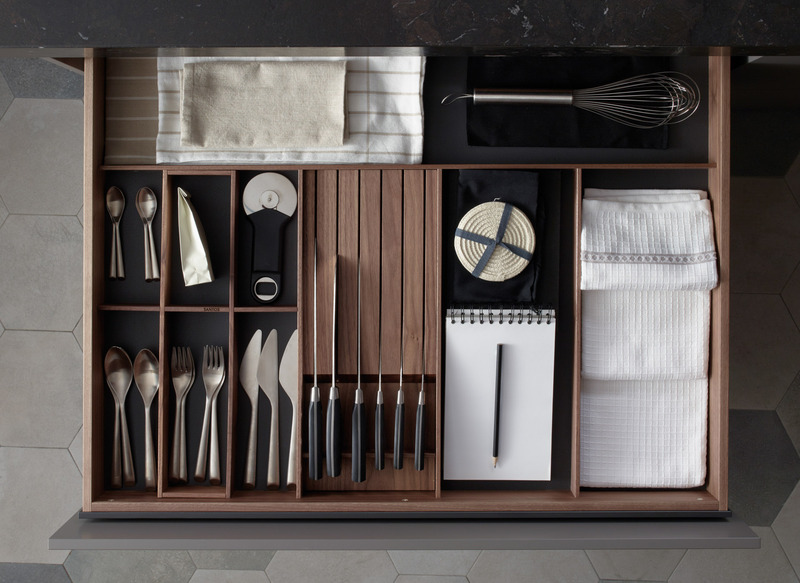 Great occasions call for large spaces, and large spaces require the right equipment. 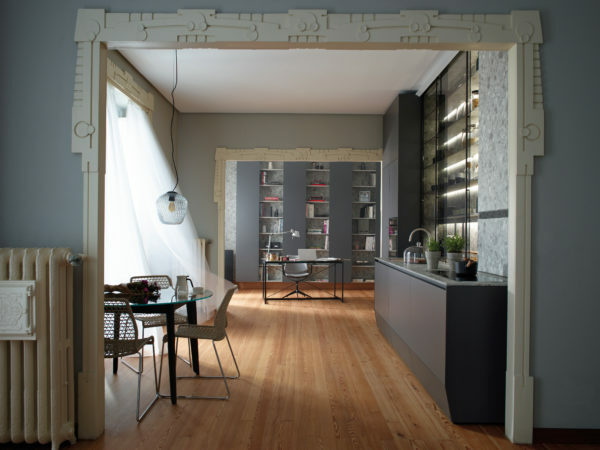 This is the core idea behind the refurbishment of this holiday home. 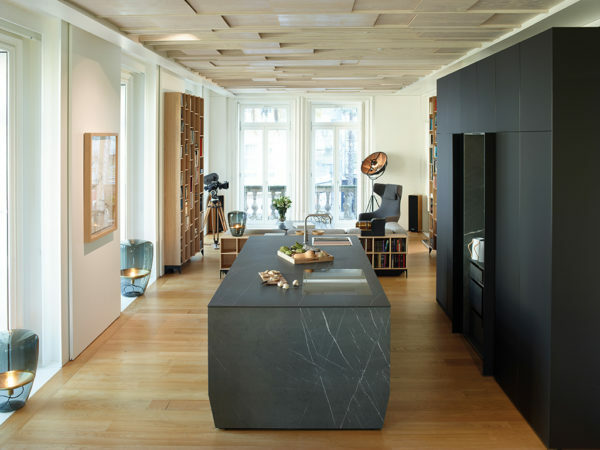 The outcome is that the kitchen with island has become the large space called for, where any gathering around the table easily turns into a great occasion. 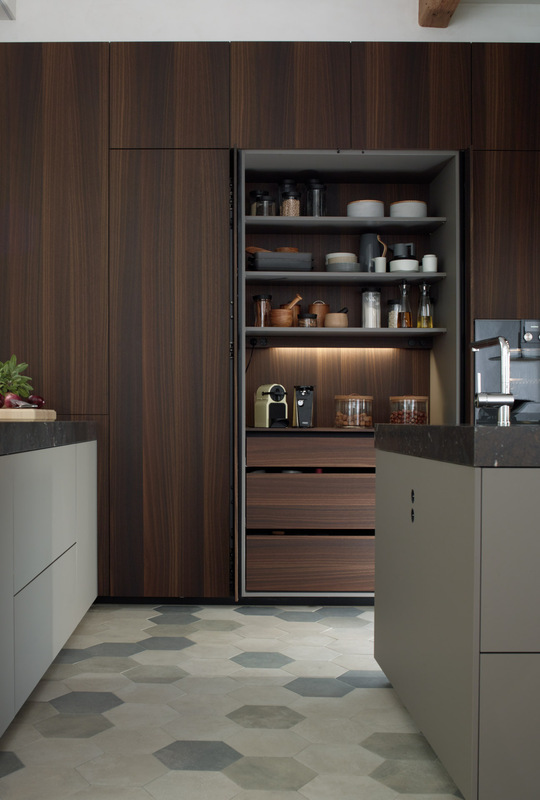 Its spaciousness allows for a large kitchen fitted with a central island, which is found right between the storage area and the dining room. 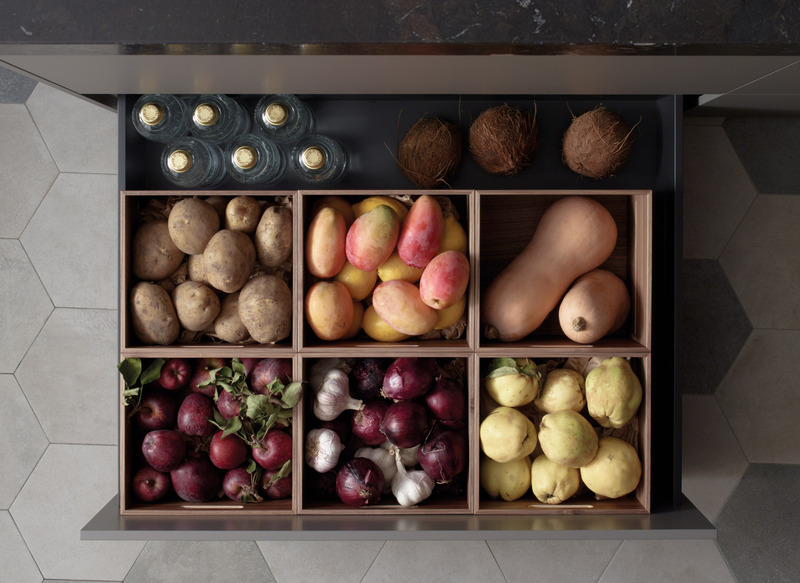 The units designed by Santos capture the essence of tradition found in the kitchens of yesteryear, while adapting to modern-day needs. 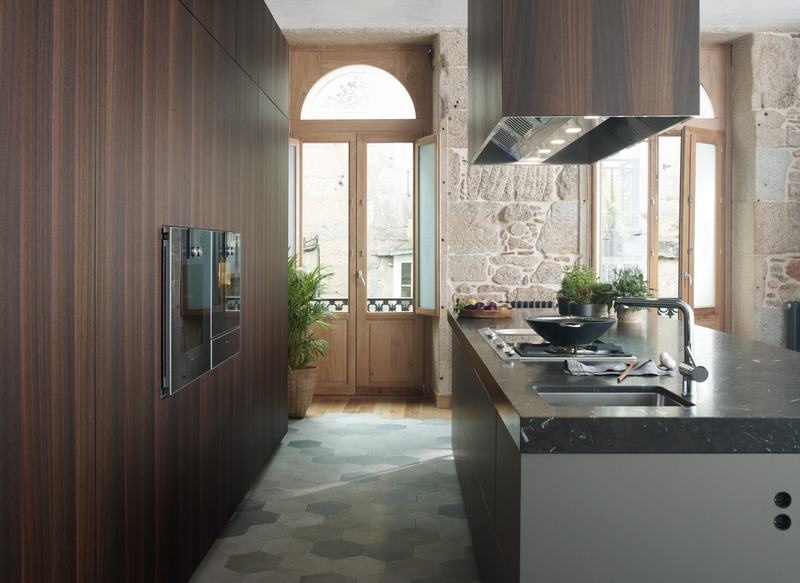 This is why the cabinets effortlessly blend into the rustic architecture characterised by thick stone walls and wooden beams. 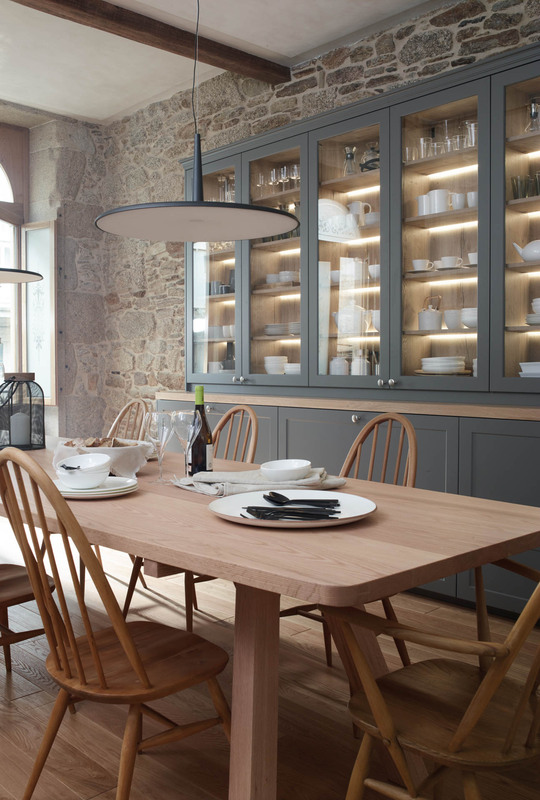 The table and the sideboard match as both are made of natural oak, helping to create a warm and cosy atmosphere. 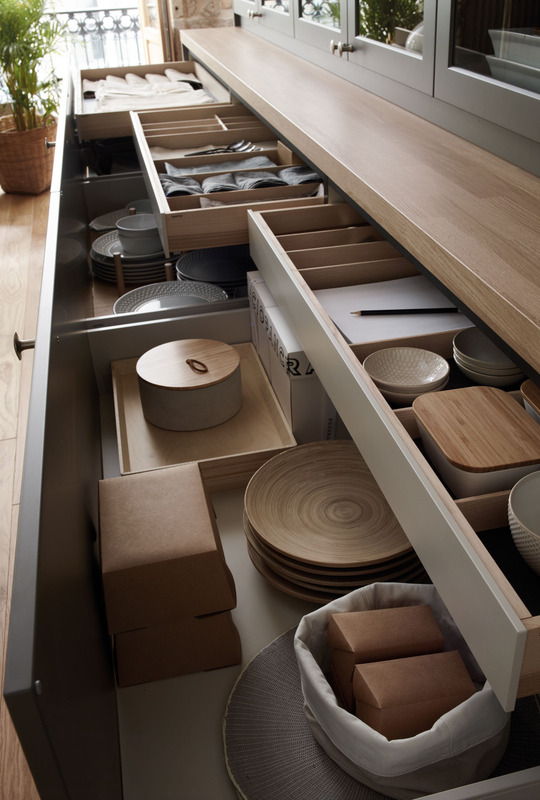 The island holds the washing-up, preparation and cooking areas, aside from an auxiliary bar and numerous options for storage and organisation. 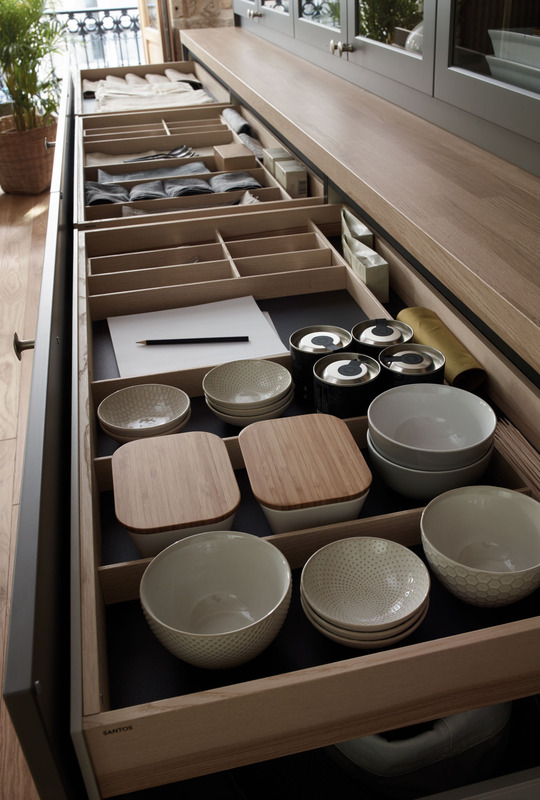 The drawers on the upper tier are fitted with pull-out and interchangeable accessories such as dividers for dishcloths, notes, cookbooks, cutlery trays, spice racks, etc. 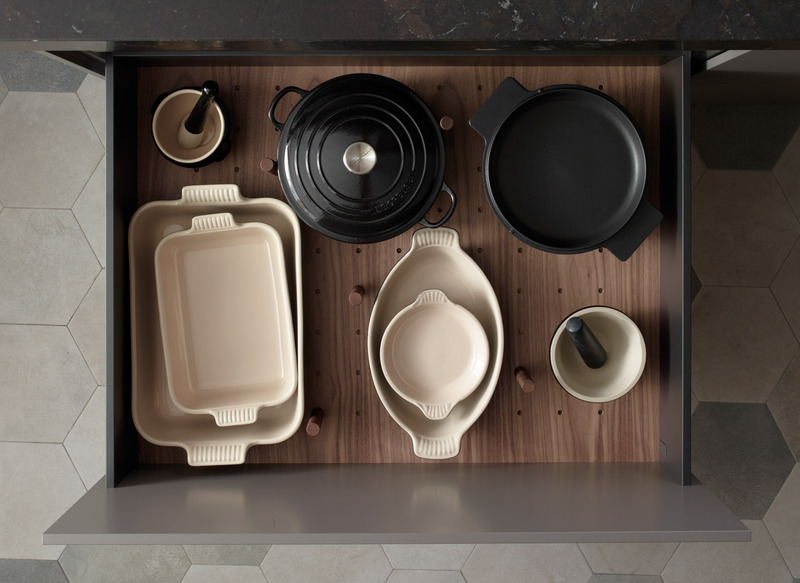 On the middle tier, the plate rack—with a moisture-resistant laminated board base and positionable wooden pivots—makes it possible to store crockery securely. 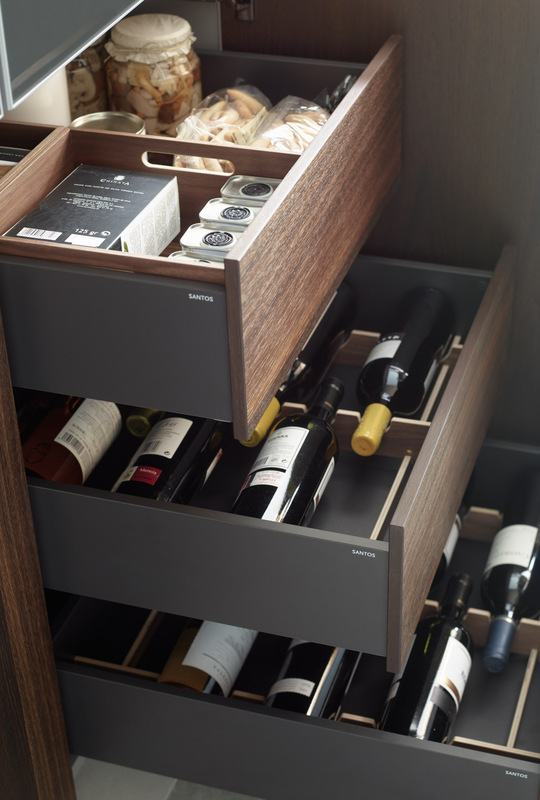 The divider boxes, which can be mixed and matched according to the users’ preferences, provide a simple solution to easily hold, organise and take out items. 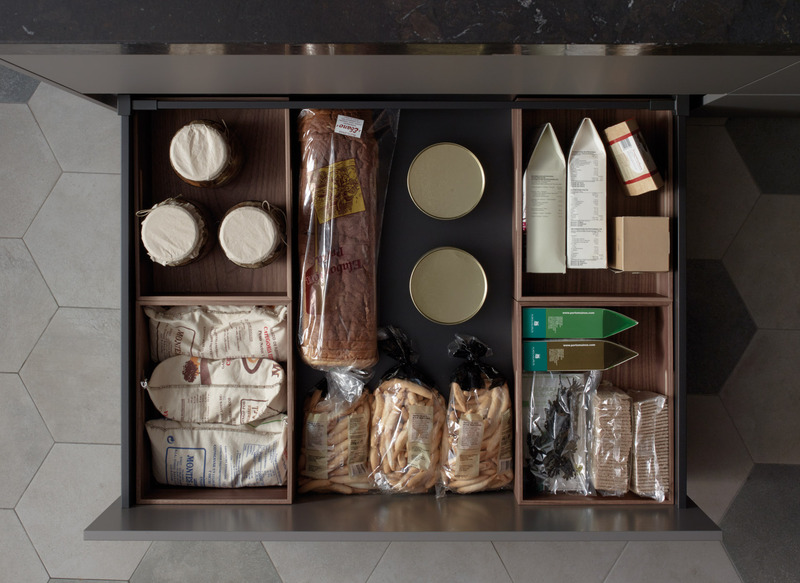 The tall unit with retractable doors provides great capacity for the storage of tableware and food. 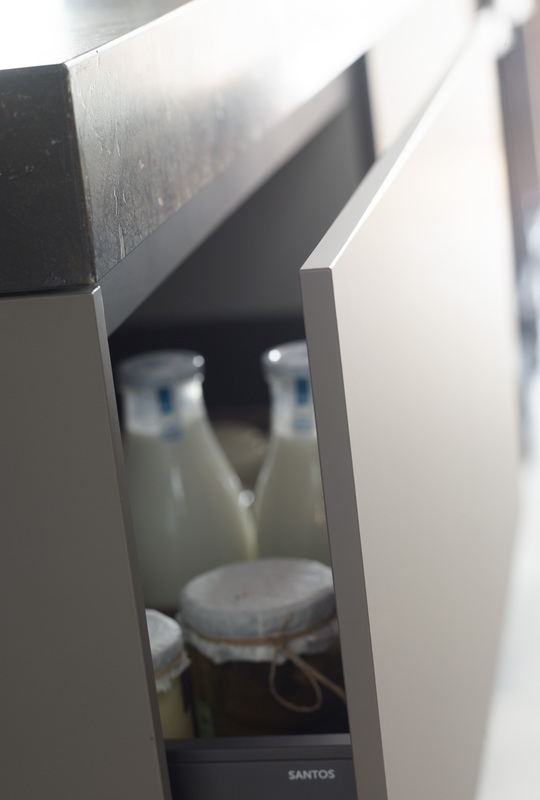 Its fronts can be hidden away along the sides of the cabinet, which includes a work area with lighting and sockets which come in very handy for small appliances. 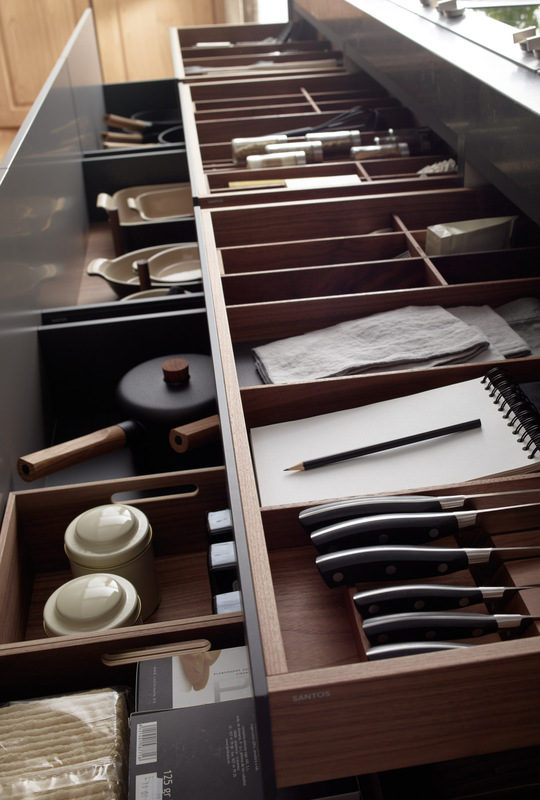 It’s the perfect place to prepare breakfast, coffee at any time of day, shakes, etc. 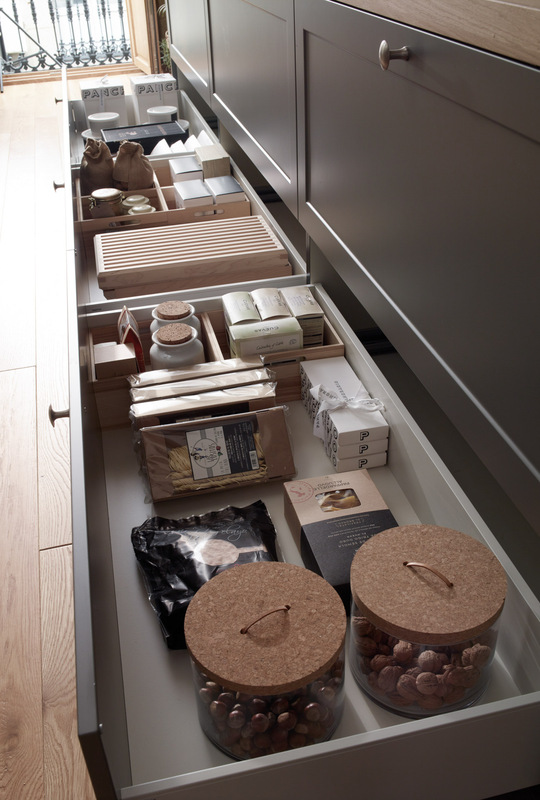 At the bottom of the tall units, the interior drawers make it a snap to organise and access their contents. 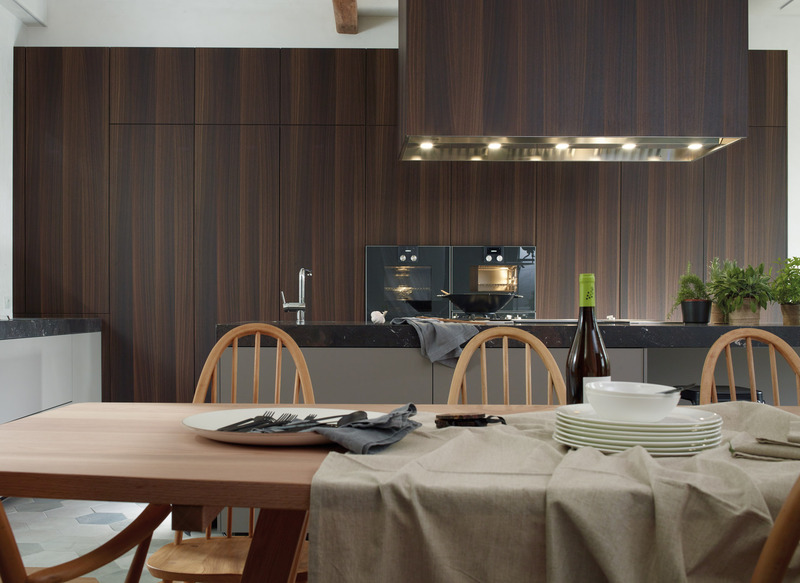 The grain remains continuous throughout the entire front of the tall units, creating a natural, harmonious appearance. 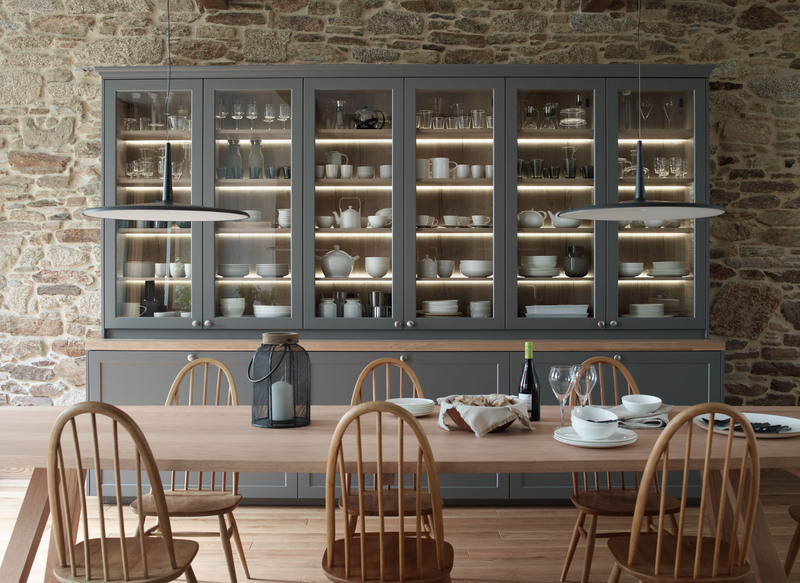 The dining area has a large sideboard with glass door units at the top, and an interior lighting system for shelves, which turns it into a source of indirect ambient light. 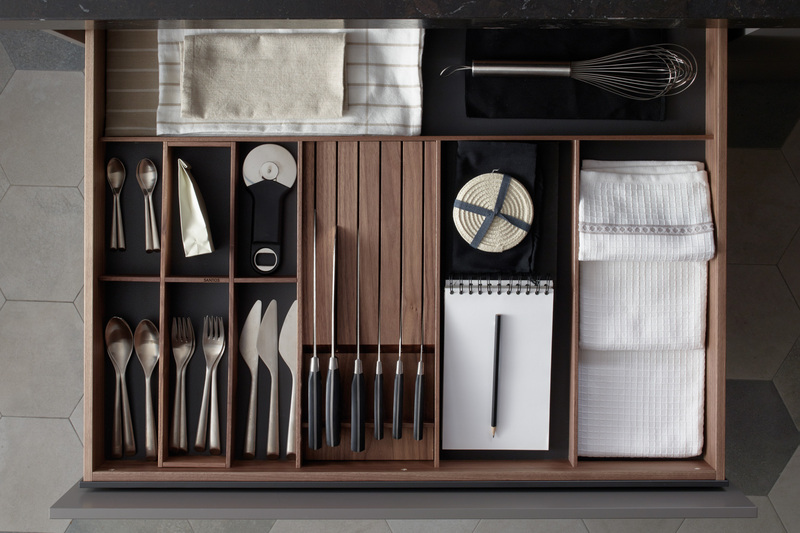 Its base units come with three drawers, fitted to hold implements common to the dining area: cutlery dividers, a place for serving trays, tablecloths and napkins, etc.